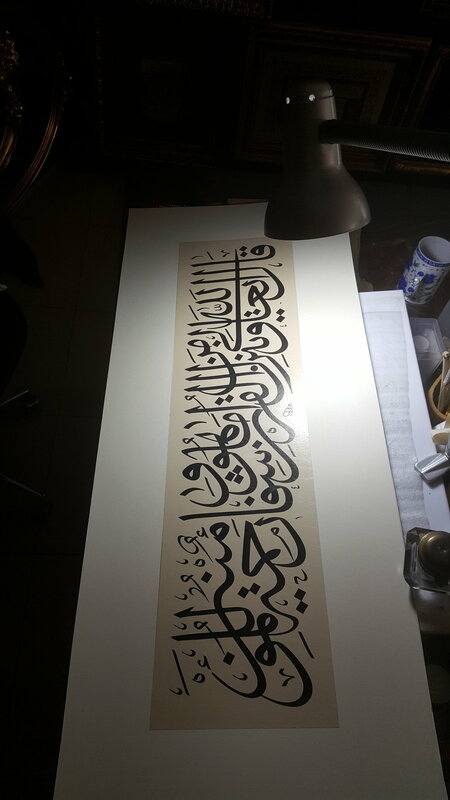 An Ottoman calligrapher once said, “It took me just five minutes to write it but 60 years to learn to do it.” The art and practice of Arabic calligraphy is a life-long journey. For many, it means traveling to places where teachers are readily accessible. As the cultural and artistic capital of many traditional arts, Turkey is rightfully the chosen destination for many aspiring calligraphers from all over the world. Once such calligrapher who has traveled to Istanbul for the love of this art is South African born Muhammad Hobe. A quick glance at his Instagram page displays not just his talent and mastery of this art, but also his love for his teachers. 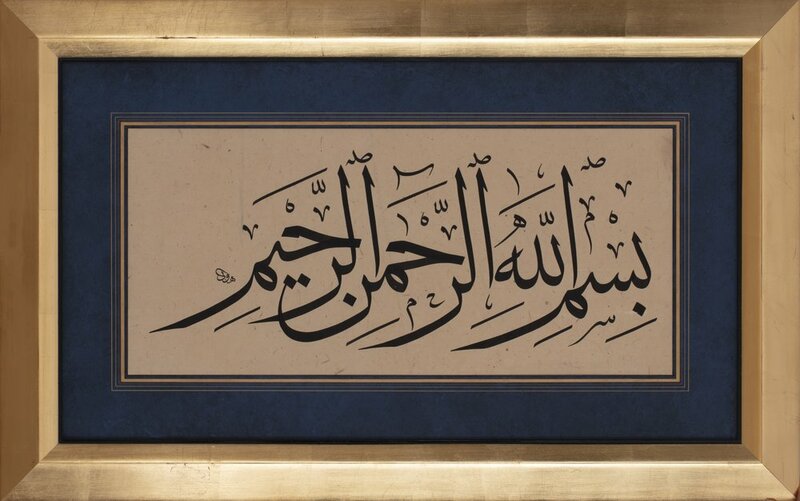 His posts also provide a small window into the culture of calligraphy in Turkey. A tradition that is passed down from teacher to student, Hobe has been dedicating his time and skills promoting the art and teaching it to many others in Turkey. Muhammed Hobe is originally from South Africa. He became a Muslim in 1990. In 1994, he went to an Islamic boarding school, Waterfall Islamic Institute, in South Africa to do Hifz (memorization of the entire the Quran) and schooling. He developed a deep interest in calligraphy in 2000 while studying at the boarding school. In 2009, Hobe went to Turkey to study calligraphy under master calligrapher, Hasan Çelebi, under whom he obtained his Icazet (diploma) in Naskh and Thuluth scripts. He currently lives in Istanbul where he produces works and also continues to learn from his teachers. He has participated in joint exhibitions with his teacher Hasan hoca and his other students. 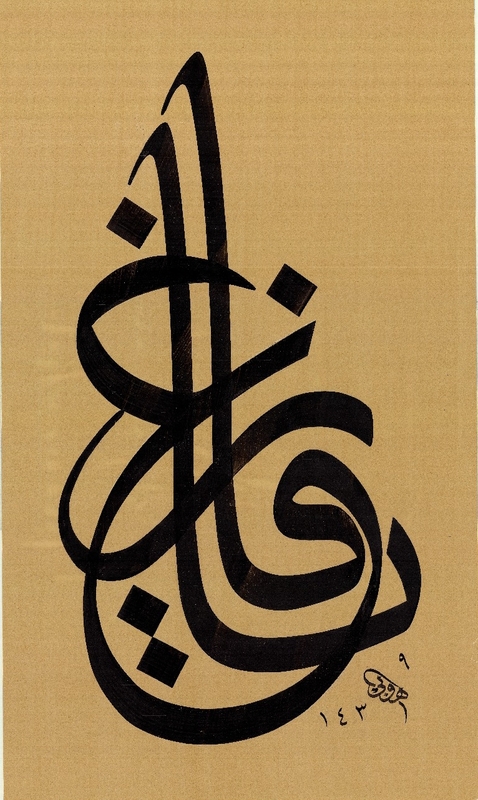 In 2017, along with other foreign artists and calligraphers, he was awarded the Turkish citizenship because of his commitment to calligraphy. Currently, apart from producing his own work, he teaches calligraphy in Istanbul once a week to a group of international students from Canada , USA , South Africa and England. I reached out to Hobe some time ago to learn more about his work, calligraphy experience and for his advice to students, like myself. This is what he shared with us. What inspired you to study calligraphy? After completing my Hifz in 2000, my teacher, the late Ml. Ibrahim Mia, suggested that I should study Arabic on Fridays. My teacher used to give us additional Khutbah (Friday prayer sermon) lessons. The system was to copy down some Ahadith (Prophetic sayings) and some verses of the Quran. We used to write using a pencil and memorize those verses and recite or read it back to our teacher the following Friday. On my first lesson, he saw my handwriting and told me that I had a very good hand. He told me to come to his office after the lessons where he gave me my first bamboo kalem (pen) and calligraphy inks. He showed me how to hold it and demonstrated a few letters. That is how I started calligraphy. What were some of your biggest challenges while studying this art? How many years did it take to obtain your Icazet (diploma)? At the beginning, one of my fears was being uncertain whether I would be able to study this until the end as I did not have a long term Turkish residence permit. Your permit had to be renewed many times so it was stressful. There were times when I used to run out of practice materials (pen, paper, ink), which was also frustrating. At times no matter how hard I practiced, I just couldn't get the desired results. But with all that, Allah always answered my prayers. And my teacher and colleagues around me always tried their best to make me feel at home. Hasan Çelebi hoca (teacher), my teacher told me to write my Icazet after two and half years. That was also due to the the fact my main focus in Turkey was studying calligraphy and I didn’t have any other occupation. I used to see Hasan hoca twice a week and I also used to visit another teacher Efdaluddin Kiliç, a student of Hasan hoca. What is it like studying in Turkey? It is very important for a student to be able to visit his/her teacher regularly and to see the hand movements. And that is one of the privileges I was afforded by staying in Turkey, that I was able to see my teacher regularly. This means that I get a lot of guidance, tips and advice on how to go about creating my works. There are also other senior calligraphers who offered a lot of help. In Turkey one gets the opportunity to see a lot of different calligraphy works and samples from different calligraphers, exhibitions and mosques. I have learnt that calligraphy is not a part-time job or hobby. One has to work very hard to be a calligrapher. One of my teachers favorite saying is that one should work 30 hours per day if one wants to be a calligrapher. My teachers are also very kind and humble. They are very supportive and motivating in that they aren't harsh in their corrections. They always search for the best letters and compliment us on that rather than dwelling on the bad ones. Hard work, dedication and respect for the teachers. To try and follow the teachers' ways , instructions and the syllabus or the tradition of this art. Not to rush and try and do all the styles in a short period and not to be in a hurry to produce works and compositions. But rather to enjoy the process and take time to learn properly. There are no shortcuts to calligraphy. I have been doing it for 8 years but there are still so many things for me to learn.